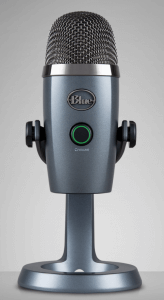 Blue Microphones has introduced Yeti Nano. It is the perfect compact mic for streaming and content creating. It is currently priced at $99.99 on the Blue Microphones website. Yeti Nano is a premium USB microphone designed for broadcast-quality podcasting, YouTube productions, game streaming, Skype/VoIP and voiceover work. Inspired by the #1-selling Blue Yeti microphone, Yeti Nano features 24-bit sound quality, a compact design, and plug ‘n play operation for instant streaming with your PC or Mac. The premium finish looks great on camera and on any desktop. With a no-latency headphone output for headphone volume, mic mute and pickup pattern, Yeti Nano is the essential mic for today’s broadcasters. Cardioid Mode: Perfect for podcasters with a single host, game streaming, Skype calls, vocal performances, voiceovers and instruments. Cardioid mode records sound sources that are directly in front of the microphone, delivering rich, full-bodied sound. Omnidirectional: Record or stream sound equally from all around the mic. Omnidirectional mode is best used in situations when you want to have a conference call with multiple participants in the same room, or a multi-person interview on a podcast.